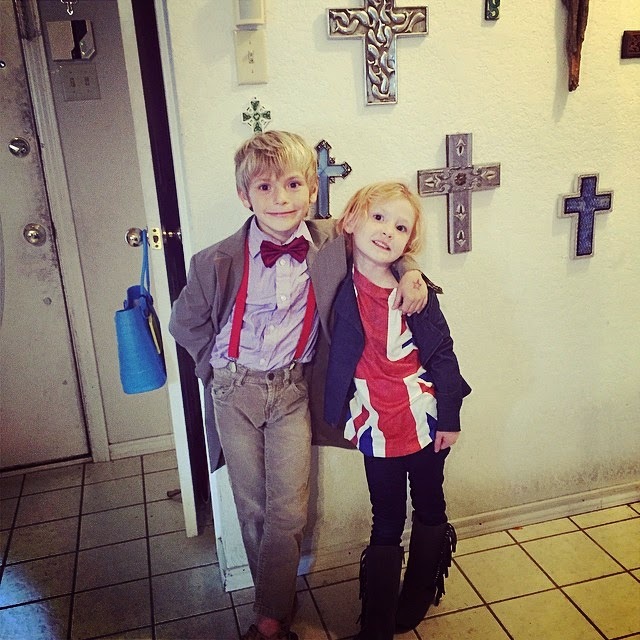 If you aren unhip like me...they are supposed to be Dr. Who and his companion Rose Tyler. All that coolness was lost on me...but the ridiculous cuteness of seeing my son in a bowtie was not lost on me even a little bit. This afternoon Tess interrupted my post Halloween nap to ask if she could eat the king sized Kit Kat that she hauled in last night by hitting the Trick-Or-Treat jackpot. I insisted that she come snuggle with me a bit before rotting all her remaining teeth. I’m not sure if it is all the costume changes in the last 24 hours but suddenly she is consumed with who she is going to be. Out of no where she tells me that she wants to be a teacher and a mommy when she grows up. Clearly, because it looks like I have the life of luxury since I have not washed my hair or put on real pants by three in the afternoon. My heart swells a bit, thinking that she wants to be just like me even though a little bit of me hopes that she will be more. I do not crush her dreams with the fact that I have hours worth of papers to grade in my bag taunting me from the corner, but I simply brush the hair out of her face and tell her that she can be lots of things. And from the way she likes to tell people what to do and how to do it that she would make a fine teacher. The she tells me, yes. “Just like Mrs. Morrison”. Oh those kindergarten teachers get all the love. Then she tells me that she also wants to be an illustrator, an author, and a singer like Katy Perry. I wince, and say, how about more like Taylor Swift. And then says that she also wants to be a cake maker. I tell her that no matter what she wants to be she will have to practice. Hoping to send her on her way while I got back to my nap. Unfortunately I could not get back to sleep because she was singing loudly and banging things around in the kitchen. She wasted no time practicing. If I had let her Tess could have gone on for another 30 minutes with another 30 things she wanted to be. And some would be down right impossible — like when she said she wanted to be a unicorn or marry her brother. None of them however were the list of things we often tell ourselves we are. I have struggled most of my life trying to sort out who exactly I want to be when I grow up. I keep telling myself that I am not a grown up yet. But. The numbers keep creeping upwards and eventually I will have to stop ordering kids meals at chickfila and admit that I have more than a few gray hairs. These days I have a better idea of what I want professionally than I ever have before, but like my six year old, that is just the beginning of who I want to be. And I’d never tell you that I want to be any of those things in the list just above. But the truth is that I often am. There are so many traits and things that I think people just are. Or they aren’t. Brene Brown talks about practicing the habits of wholehearted people. That people are not just born brave or authentic, that those are things they practice over and over again. And I like that idea, that these good traits are things you grow not things that you are born with or lacking. In other words, there is hope for me yet. But the negative traits. I think maybe I still think we are stuck with those. And like body types some of us get stuck with more or less than others. Some people are just naturally thin. So maybe that means that some people are naturally secure. Or patient. Or do not love carbs like I do. “It is just that insecure women mask it by tearing other women down, but wise women mask that insecurity by raising people up”. ( I swear I stopped and re-wound that part of the video clip at least three times). And their is something comforting in that. Not comforting like comparison. Because those kinds of thoughts just make me feel better because someone else looks worse. But. Comforting. Like I am not missing something that they have that I don’t. And I know this. I know that the people I admire most are scared and sometimes wrong and probably spill their coffee down the front of their shirt sometimes too. And when I get to see it I swear it only makes me like them more. When people above me hide what they don’t know or attempt to mask insecurities by yielding power it has the exact opposite effect. My daughter is interested in who she wants to be when she grows up. And she is only six so the world is open wide for her. I am 36. And my choices are just a bit more limited. I will never be Katy Perry. Or Taylor Swift. And frankly I have no desire to be. But maybe like Tess, I should still be just as concerned with who I will grow up to be and what I need to keep practicing. And those things that I think keep getting in the way are pretty much in everyone’s way. So I can mask them weakly or wisely. To put others down or build them up. These aren’t just masks that people break out on Halloween but mostly the ones we wear every single day. So I should pick a good one. And on that note, Taylor Swift is still singing in my kitchen….and I should get out of bed and eat some of her Halloween candy while there is still some left.